This allows you to take control of the most deadly attack submarines in operation at the beginning of the 21th Century: the American Seawolf and 688(i), and the Russian Akula and Akula II. 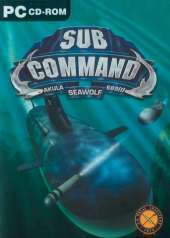 As the worthy successor of 688(I) Hunter/Killer, Sub Command provides an extensive, if not excessive simulation of most of the stations present on a real combat submarine - which include navigation, fire control, ship control, TMA (Target Motion Analysis), radar, radio and everyone's favorite, periscope - and ships with a consequent 232 page manual. More than 250 submarines, ships and planes also have been modeled in the game. Newcomers will spend long nights trying the stand-alone missions and figuring out how to launch a torpedo on the Akula, while experienced submarine officers will be able to take part into the main game campaign or battle out in multiplayer missions.